Sitting above Lake Blue Ridge with view’s you dream about, this beautiful 5BR 3BA luxury home is the perfect vacation spot. Located in the Aska Adventure Area, just minutes from the quaint mountain town of Blue Ridge GA, this is a GREAT location for those who want to visit the local antique shops and events happening in the area. The outdoor activities are endless in the north Georgia mountains where Boating, Hiking, Kayaking, Tubing, White Water Rafting, Paddle Boarding, Horseback Riding, and Zip-lining are all right at your fingertips. You can also visit the Waterfalls, Hike to a Swinging Bridge, or take a more relaxed approach and enjoy a great meal at one of the many wonderful restaurants or breweries located in downtown Blue Ridge. Don’t forget to take a ride on the Blue Ridge Scenic Railway, be entertained at the Big Foot Museum or step back in time at the local Swan Drive-in Theater. There is something for everyone in the mountains! A beautiful rock wood burning fireplace welcomes you into the open living, dining and kitchen of the home but the view is what you’ll remember. The kitchen has stainless appliances and all the amenities of home. The home features 3 King BR's, 1 Queen BR, 1 with 2 Twin beds and 3 full bathroom’s. The Master Bathroom has a shower, double sinks and Jacuzzi Tub. This home accommodates 10 comfortably. 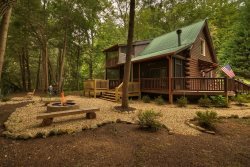 Free WiFi, outdoor Fire-Pit, Gas Grill, Hot Tub and a Game Room with a Pool table and movie viewing area are just a few of the great amenities of the home. The upper deck is screened so you can enjoy the stunning view without the pesky bugs and on the lower deck just walk out of your bedroom to the Hot Tub and relax with nature. The Fire-Pit is on located below the lower deck and is the perfect gathering spot for some hot dogs or s’mores. The home has paved access and is motorcycle friendly. Views are spectacular!! Very well maintained home. Very comfortable beds. Perfect place for 4-5 couples to get together.